LG finally announced its newest flagship smartphone, the LG G2 at an event in New York. It is the company’s first smartphone introduced under the new “G” Series for premium devices. LG has also removed the side buttons and placed them on the rear of the device. Long-pressing on the rear-mounted volume keys allows us to launch QuickMemo and the camera. It also comes with a number of user experience (UX) features including Answer Me, Plug & Pop, Quick Remote, Slide Aside, Guest Mode and so on. LG G2 features a 5.2 inch Full HD IPS display, sporting a resolution of 1080 x 1920 pixels, Android 4.2.2 (Jelly Bean) Operating System, 2.26 GHz Qualcomm Snapdragon 800 quad-core processor, 13 megapixel rear-facing camera with auto-focus and LED flash, full HD (1080p) video recording and playback, 2.1 megapixel front-facing camera for video calls, Bluetooth 4.0 with A2DP and more. Other features include a 3.5 mm headset jack, Stereo FM Radio with RDS, Wi-Fi 802.11 a/b/g/n, 4G LTE Connectivity, DLNA, Wi-Fi Direct, Wi-Fi hotspot, microUSB 2.0, MHL, GPS with A-GPS, 2 GB RAM, 16/32 GB internal memory, NFC (Near Field Communication) and a 3000 mAh battery. This handset measures 138.5 x 70.9 x 8.9 mm. LG G2 will be rolled out in the next eight weeks starting in South Korea followed by North America, Europe and other key markets. This handset will be initially available in black and white colors. Sony finally launched the Xperia Z Ultra phablet in India. This devices was announced and showcased last month at the Mobile Asia Expo 2013 in Shanghai. It comes with a large 6.4 inch Full HD display along with a 2.2 GHz quad-core processor. Similar to the other Xperia smartphones, the Xperia Z Ultra is also a water and dust resistant smartphone. It is the world’s slimmest Full HD smartphone with a beautifully crafted 6.5mm body and weighing just 212 grams. 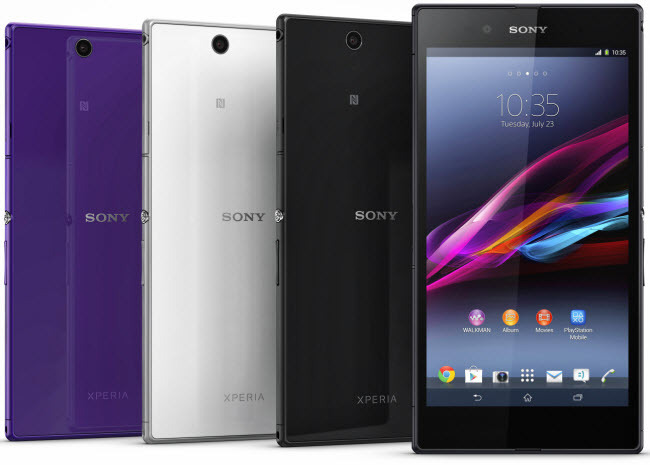 Sony Xperia Z Ultra features a 6.44 inch Full HD Triluminos display, sporting a resolution of 1080 x 1920 pixels, 2.2 GHz Qualcomm Snapdragon 800 quad-core processor, Android 4.2 (Jelly Bean) Operating System, 8 megapixel auto-focus camera with Full HD (1080p) video recording and playback, 2 megapixel front-facing camera for video calls, 16 GB internal memory, MicroSD card slot, 64 GB expandable memory and more. Other features include a 3.5 mm audio jack, FM radio with RDS, 2 GB RAM, Google Play Store, GPS with A-GPS, Bluetooth 4.0, DLNA Certified, HDMI support, Micro USB, USB 2.0, Wi-Fi 802.11 b/g/n, 3G Connectivity, NFC (Near Field Communication), Wi-Fi Hotspot functionality, up to 120 hrs of music playback time, up to 14 hrs of talk-time,upto 790 hrs of stand-by time and a 3050 mAh non removable Li-ion battery. Sony Xperia Z Ultra comes with a price-tag of Rs.46,990 (approx.$780) in India, however you can get this device for just Rs.44,990 at Flipkart. This device will compete with other Android phablets such as Galaxy Note II and LG Optimus G Pro in India. BlackBerry recently launched the mid-range BlackBerry Q5 smartphone in India. It is the company’s third device which runs on the BlackBerry 10 Operating System. This handset packs a 3.1 inch touchscreen display along with the Blackberry’s iconic QWERTY keyboard. This handset allows you to access more than 120,000 apps from the BlackBerry World. The BlackBerry Q5 smartphone is specially designed for those who want to experience the BlackBerry 10 Operating System without burning a hole in the pocket. The BlackBerry Q5 comes with a price tag of just Rs.24,990 (approx. $420). This handset will be available in Black, Pure White and Pure Red colors. BlackBerry Q5 will go on sale from July 20 in India. Samsung finally announced the much-awaited Galaxy S4 Zoom. Similar to the previously launched Galaxy Camera, this device combines the features of a smartphone with an advanced 16 megapixel CMOS sensor, OIS and Xenon flash. Samsung Galaxy S4 Zoom is the first smartphone to offer 10x optical zoom. This handset comes with voice calling facility and it runs on the latest Android 4.2.2 (Jelly Bean) Operating System. The In-Call Photo Share feature on this device allows you to share pictures via MMS to the person you are talking to. Samsung Galaxy S4 Zoom features a 4.3 inch qHD TFT display, sporting a resolution of 960 × 540 pixels, 1.5 GHz dual-core processor, Android 4.2.2 (Jelly Bean) OS, TouchWiz 5.0 user interface, 16 megapixel rear-facing camera with 10x optical zoom and enhanced SMART Modes, OIS 24-240mm, F3.1-F6.3, 1.9 megapixel front-facing camera for video calls, 8 GB internal memory, microSD card slot, 64 GB expandable memory and much more. Other features include a 3.5 mm headset jack, Stereo FM Radio with RDS, Wi-Fi 802.11 a/b/g/n, 3G/4G Connectivity, Samsung Media Hub, Samsung Social Hub, Samsung Kies Air, Google Play Store, S Translator, Samsung ChatOn, DLNA, HDMI out, Bluetooth 4.0 with EDR, 1.5 GB RAM, Wi-Fi Direct, USB 2.0 and a 2330 mAh battery. This device measures 125.5 x 63.5 x 15.4 mm and weighs 208 grams. Samsung has not yet announced the price and release date of this handset. The Galaxy S4 Zoom is expected to go on sale from Q3 of 2013. Stay tuned! Back in April, Samsung announced the 7 inch Galaxy Tab 3. Now, the South Korean tech giant introduced two new members in the Galaxy Tab 3 series – the 8 inch and 10.1 inch Galaxy Tab 3. These devices runs on the Android 4.2 (Jelly Bean) Operating System. The 8-inch Galaxy Tab 3 is the company’s second 8 inch tablet, while the 10.1 inch Galaxy Tab 3 is the successor of the Galaxy Tab 2 10.1. This device is little slimmer and lighter than its predecessor. Samsung Galaxy Tab 3 8-inch features a 7 inch WXGA TFT touchscreen display, sporting a resolution of 1280 x 800 pixels, 1.5 GHz dual-core processor, Android 4.2 (Jelly Bean) Operating System, Samsung TouchWiz UI, 5 megapixel rear-facing camera, Full HD (1080p) video playback, 1.3 megapixel front facing camera for video calls, 3G/4G Connectivity, Wi-Fi 801.11 a/b/g/n and much more. Other features include a 3.5 mm headset jack, Bluetooth 4.0, USB 2.0, Wi-Fi Direct, Samsung Hub, Samsung Kies Air, Samsung ChatON, Google Play Store, A-GPS, 16/32 GB internal memory, MicroSD card slot, 64 GB expandable memory, 1.5 GB RAM, A-GPS ＋ GLONASS and a 4450 mAh battery. This device measures 209.8 x 123.8 x 7.4 mm and weighs 314 grams. Samsung Galaxy Tab 3 10.1-inch features a 10.1 inch WXGA TFT touchscreen display, sporting a resolution of 1280 x 800 pixels, 1.6 GHz dual-core processor, Android 4.2 (Jelly Bean) Operating System, Samsung TouchWiz UI, 3 megapixel rear-facing camera, Full HD (1080p) video playback, 1.3 megapixel front facing camera for video calls, 16/32 GB internal memory, MicroSD card slot, 64 GB expandable memory and so on. It also comes with the usual 3.5 mm headset jack, Bluetooth 4.0, USB 2.0, Wi-Fi Direct, Samsung Hub, Samsung Kies Air, Samsung ChatON, Google Play Store, A-GPS, 3G/4G Connectivity, Wi-Fi 801.11 a/b/g/n, 1 GB RAM, Readers Hub, Music Hub, Game Hub, A-GPS ＋ GLONASS and a 6800 mAh battery. This device measures 243.1 x 176.1 x 7.95 mm and weighs 510 grams. Samsung Galaxy Tab 3 8-inch and 10.1 inch is expected go on sale from Q3 of 2013. The price and release date of this devices will be announced in the coming weeks. Samsung finally announced the rumored Galaxy S4 Mini smartphone. This mid-range handset is the stripped down version of the company’s flagship Galaxy S4 smartphone. The 5 inch full HD display, octa-core processor and 13 megapixel camera found in the Galaxy S4 has been replaced with a smaller 4.3 inch qHD display, less powerful dual-core processor and 8 megapixel camera. However, this handset runs on the same Android 4.2.2 (Jelly Bean) Operating System and packs all the gimmicky features which was first seen in the original Galaxy S4. Samsung Galaxy S4 Mini features a 4.3 inch qHD Super-AMOLED display, sporting a resolution of 960 × 540 pixels, 1.7 GHz dual-core processor, Android 4.2.2 (Jelly Bean) OS, TouchWiz Nature UX, 8 megapixel rear-facing camera with autofocus and flash, full HD (1080p) video recording and playback, 1.9 megapixel front-facing camera for video chats and much more. It also comes with a 3.5 mm headset jack, Stereo FM Radio with RDS, Smart stay, Smart pause, Smart scroll, 8 GB internal memory, 5 GB user memory, microSD card slot, 64 GB expandable memory, S-Travel, S-Health, DLNA, HDMI out, Bluetooth 4.0 with EDR, Wi-Fi 802.11 a/b/g/n/ac, 3G/4G Connectivity, 1.5 GB RAM, Wi-Fi Direct, NFC, Bluetooth 4.0 and a 1900 mAh battery. This handset measures 124.6 x 61.3 x 8.94 mm and weighs just 107 grams. The Galaxy S4 Mini will be available in two colors – White Frost and Black Mist. Samsung has not yet announced the price and release date of this handset. The Galaxy S4 Mini will be showcased next month at the company’s Galaxy and Ativ focused event in London.